I am still travelling in the UK, and thus have not been able to follow, in any detail, the environmental disaster that is unfolding along the Louisiana coast, as the oil from the Transocean Deepwater Horizon fire and sinking spreads across the Gulf of Mexico. However I thought that it might be useful to explain where part of the problem might lie, and so am going to repost one of the technical posts from the past, where I explain what a blow-out preventer is. Then I will add a couple of comments on why it might be that they did not stop the leak in this case. This post is going to deal with some of the problems that a driller encounters as he reaches the layer of rock (the reservoir) in which the oil or gas is being held. And what I want to talk about is something called Differential Pressure, but to explain that, I need to drag you back to High School for just a minute. Let's, in fact, go back to Newton's Three Laws. And, for those who slept through that part of the Physics class in school, don't be too ashamed - I have seen the desk where Newton whittled his name, being similarly bored. Let's start with the first law, which is probably the most relevant. Every object in a state of (rest or) uniform motion tends to remain in that state of (rest or) motion unless an external force is applied to it. Except that I want to change external force into pressure (which is force divided by area) since it is the way we normally think of it. (Note: I added rest which is a special case of uniform motion since that is specific to the oil we want to talk about). In other words, nothing is going to move unless something pushes it. It is what does the pushing and what does the moving that this is all about. And now our drill, is down through the casing, drilling the well open hole and using the circulating mud to carry away the cuttings as it continues to go deeper. I had stopped progress last week just before we went down to total depth (TD) of the well, or into the pay. And the reason I did has to do with this differential pressure. But first, the bit about how you calculate pressure. As you go deeper into the earth, the rock at any layer is carrying the weight of all the rock vertically above it. For rough calculations we generally consider that this rock weighs 144 lb a cubic foot. So that 10 ft down the weight of the overlying column on a square foot would be 144 x 10 = 1,440 lb/sq ft. But through convention we reduce the area that we talk about to a square inch (144 sq in= 1 sq ft) so with this division the weight on a square inch would be 10 lb. A remarkable resemblance to the depth number (grin). This means that we can assume, as we go deeper into the earth, that the pressure on the rock increases by 1 lb/sq. inch (psi) for every foot we go deeper. This means that at 6,000 ft, the rock is under a pressure, from the rock above it, of 6,000 psi. Now water does not weigh as much as rock, but can be approximated to roughly half the weight. So that, by the same argument, under water, for every foot of depth the pressure goes up roughly half-a-psi. So that at 6,000 ft under water the pressure is 3,000 psi (roughly twice the water pressure in the wand you use at a car wash). Now because we have increased the density of the fluid in the well (the mud) to help lift the cuttings out of the hole it weighs a bit more than water, but for the sake of working the example I'm going to use the half-psi measure for now. We are now at the point where the actual amount that it weighs becomes important. Simplified sketch of an oil bearing layer in the ground. I have made a very simple sketch of the layer of rock that we are going to drill into. In order to trap the oil it is shaped into a dome, and the sketch shows a vertical slice through that dome, viewed from the side. It has a layer of oil in it (the reddish layer), but above that is a layer of gas that has diffused from the oil (brownish), and below it is water (bluish) which may have been there when the algae died and which has stayed with the remains as they turned into oil under the temperatures and pressures deep in the rock. Oil floats on water, and gas is lighter than oil, so we have the three layers. At the moment the well has not arrived and all three fluids are sensibly in equilibrium at the same pressure. 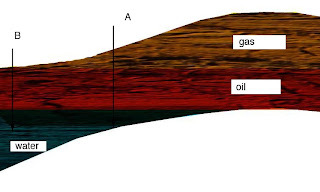 Now why do we need to know this before we reach our layer of oil-bearing rock? Well first let's go and interpret that first law a little more. If a person on either side of you pushed you with equal force at the same time, you don't move, because the two forces balance out. It is only if there is one force, or if one of the two pushes harder, that you move. In other words, where there are a number of forces acting on a body, it is the size of the difference in pressures, and the direction of that difference, that controls the movement. Consider, here we are drilling merrily away (and have cased the well near the surface, and hit no more fluids on the way down) and at 6,000 ft. we penetrate the rock that is capping the well, and enter the rock with the oil in it. The oil (in the rock) is at some fraction of the overburden pressure, since it is trapped in the rock, and for the sake of this example I am going to say that it is at 5,000 psi , the fluid in the well is at 3,000 psi, the height of the mud column. There is a difference of 2,000 psi. We are drilling a hole some 6-5/8th inches in diameter. That has an area of about 34.5 square inches. The total force we have suddenly applied to the bottom of the well (bit and fluid) is thus (area x pressure difference) 34.5 x 2,000 = 69,000 lb (or 35 tons). It's called a blow-out, and sadly, as we have just seen in the Gulf, they can still happen. 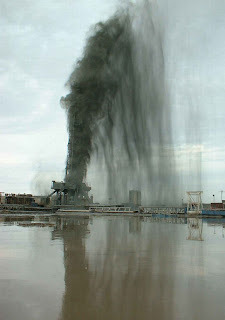 This is why we approach the oil/gas producing zone of the rock with caution. And bear in mind that the driller that is controlling the progress of this well is at the surface, trying to guide the bit at the bottom of the hole, with, historically, little immediate information to help. Based on the surveys that brought the crew to the site in the first place he knows roughly how thick the layers of rock are, and probably what rock they are, but the only real information on where the bit is in that sequence, is from the returns (cuttings) that come out of the well, and there is the lag, we mentioned before, while those chips make their way up the 6,000 ft pipe. (This is why Measurement While Drilling [MWD] has been such a relatively recent boon to the industry ( though not all rigs have it). By monitoring a number of pressure gages the driller can gain a sense of what is happening at the bottom of the well. If he senses that there is going to be a problem, then he can do one of several things, based on the way the well is set up. The first thing is to increase the density of the mud. By making the fluid in the well weigh more, the difference in the pressure across that face is reduced, and the change in conditions is easier to handle. However weighting up the hole has the disadvantage that it becomes much slower to drill with a heavier mud (it is a poor bottom-hole cleaner among other things). And, if done during drilling, bear in mind that once the heavier mud is added to the well it won't be fully effective until it has had time to get down to the bit and then fill back up the annulus between the drill string and the casing all the way to the surface. So that is an expensive and slow option. Let us take the game a little more interesting and say that there is a gas pocket above the oil, and that the hole is going to go into the layer at A. Gas will enter the well at the down-hole pressure, but as the bubble rises, that pressure is reduced, and the gas expands, pushing the mud above it out ahead of itself. Another potential source for big-time trouble. And this one (which is known as a kick in the well) happens much faster, so there is less time to react. How do we handle this? The answer is to invert the problem. Gas or oil flows into the well because the well is at a lower pressure than the fluid in the rock. The fluid in the well is, initially at the pressure created by the depth, and by the weight (density) of the mud in the hole. However, if we put a restriction on the flow of fluid out of the well (such as when you put your finger over the end of a garden hose so that the stream becomes smaller and shoots out further) we can increase the pressure in the well. For those who want to know why, if the same volume has to go through a smaller hole in the same amount of time it has to go faster. This means it has to be pushed harder. Bernoulli explained it, and there is an animation available that helps explain it. What it means is that by adjusting the flow out of the hole, the driller can adjust the internal pressure, and thus "kill the kick", or if gets to be too much of a problem, “kill the well”. But it is not completely that simple. Bear in mind that there is all the drilling and rotating equipment on the rig floor connected to the drill pipe at the top of the well. None of this can stand much pressure. So we need to place another piece of equipment between the drilling rig, and the top of the well. This is the Blow-out Preventer(BOP), which is essentially a ram that very rapidly shuts off fluid flow at the top of the well. These have to be well designed, since they are generally the line of last defense against a blowout, and when they fail as the pictures show serious problems arise. They also form the basis for the well-known structures, often referred to as Christmas Trees, that sit at the top of producing wells. By themselves, however, these aren't enough, since their main function is just to slam the door shut, before all the oil gets out and we have a gusher. The more critical tools are the chokes on the well. (Below the rams in the picture above). There are generally several, both hydraulically operated and manual (in case the power dies) which are simply large valves that can be turned to increase or reduce the size of the flow path out of the well over to the mud pits. By adjusting these, in real time, the driller can control the well pressure, and thus the dynamics of the behavior at the bottom of the well. And after the rig leaves, an operator can adjust well pressure, and thereby the production from the well and its long-term performance. If the operator is well trained (and you find drilling simulator equipment in Petroleum Engineering Departments so that students can understand how to do this (I last tried some decades ago) the well pressure will be controlled, so that any kicks can be handled, and the drill can now penetrate safely into the rock containing the oil/gas, which we call the reservoir, or the pay. To return to the present it appears that the blow-out preventers, which are located on the sea bed, did not work as they should, in this case. Whether that is because the pressure of the surrounding water (they are at a depth of around 5,000 ft and thus there is about 2,500 psi pressure, which is significant, but these days not an insurmountable level) or because of some other failure is unclear. But since the gas and oil seems to have come straight up to the platform where it ignited, then it logically must have gone up the pipe or riser that would carry oil from the well to the surface. Thus it had to pass through the BOP. Both manual and remote attempts to activate the BOP did not work. The risers have now collapsed, and the area around the well completion is now a mess of wreckage, so that access to the area is not easy. Further the robotic vehicles sent in to try and get the BOP to work effectively haven’t been able to do their job. And the leak may now be coming from a larger area than just the top of the well casing. The current plans are to contain the spill and to drill an intersecting well that can seal the original flow path, and contain the oil, through BOP on the second well. But that will take some time to put in place. There are additional bits of information in the technical posts that I have written in the past, and that are listed on the right side of the page. Are there more disasters involving rigs in the deep sea, or those on land? Is one safer than the other? I am an engineer, and I am wondering, why didn't attach heating elements to the dome they sent down there and transmit high voltage electricity through a cable down there to heat and therefore melt the gas that was apparently forming a solid under the low temperature and high pressure? Also, why the heck they are not using lead and imbedded heating element to melt the lead and incase the messy structure to a manageable form. I think they need engineer such as myself that understands plumbing, heat and fluids. I have not seen a sophisticated and smart approach to this problem on their part. I have a solution in mind for them, but did not hear back from them when I contacted BP. but think it's time stop the flow of oil, flooding the area to prevent further contamination of water, wildlife. I'm sure BP is doing all they can to solve the problem. As far as I know energy industry is well aware, and very sensitive about ecology, social perception. Disasters were part of human experience in the past, and it seems present time is also producing undesirable results. Energy industry is not only essential in terms of standard of living we enjoy at this time, but also has the capacity, intellectual, as well as economic, to provide variety of solutions. of economic activity, which is not only evident, but alarming. "non accidental" progress, innovation, especially with regard to human survival. and enrich perception beyond basic needs. Let's hope that every lesson we learn from our experience, will produce long lasting solution.